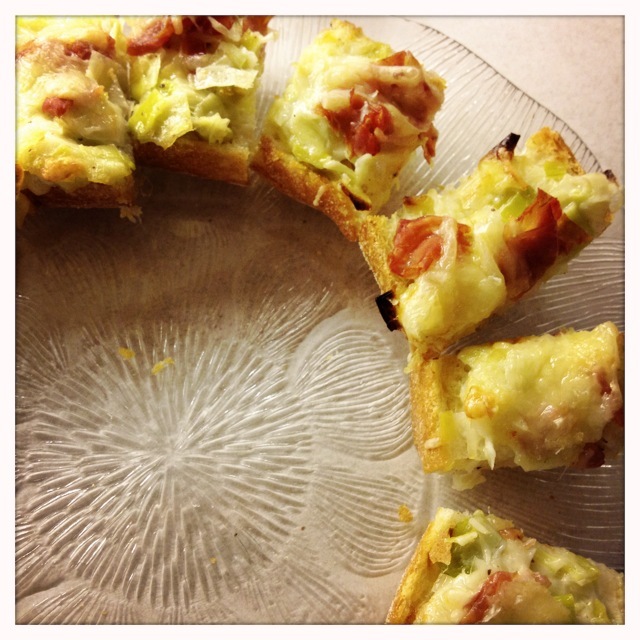 I made this yummy appetizer for my mom’s birthday, and it was a big hit. I used the leek recipe from here, but then changed the recipe a bit by adding the prosciutto and switching the brie for gruyere. The brie would be amazing on these, but we already had one appy using it, so I wanted to use a different cheese. You can make the leek part ahead of time, and then make them up just before you need to serve them. 1. Heat the butter in a frying pan, then add the leeks. Cook for about 15 minutes, until they are soft, but not browned. 2. Add the cream and bring it to a boil, then cook for about 2 minutes. Stir in the parmesan, salt and pepper. 3. Slice the bread in half lengthwise and put it on a baking sheet. Spread the leek mixture onto the bread. 4. Put some prosciutto on the bread, then top with some grated cheese. 5. Bake at about 400F for about 10 minutes, or until the cheese is melted and bubbling a little. 6. Slice the bread and serve right away.